Lindsay McKenna is an ace writer of military love stories with romance and a favorite of mine. Her attention to detail holds your interest, the thrill of danger takes you to the edge and the romance and subtle attention she gives to the progress of a relationship wants you to read her books more and more and again and again. 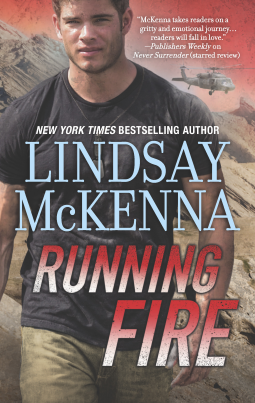 “Running Fire” is book#8 of her Shadow Warriors Series is equally drenched with adrenaline and romance in equal doses as Chief Warrant Officer and pilot Leah MacKenzie and SEAL Kell Ballard try to escape the Taliban infused mountains of Afghanistan. Badly injured when the Taliban brings down her helicopter, Leah is saved and nursed back to health by Kell. Ever the warrior and protector, close proximity with Leah opens feelings that Kell has subdued after an unsuccessful marriage. As they make their way one cave a time, keeping themselves one step ahead of danger, Kell and Leah succumb to the attraction that flares between them. With an abusive past and trauma dogging Leah, Kell vows to protect the love of his life forever, right next to him. Another enthralling ride of danger and love, “Running Fire” keeps the readers glued to every page. With the chemistry between Kell and Leah stoking the pages, Leah gathers strength from Kell and his family to face her past and Kell fills Leah’s heart with love, warmth and the support of a wonderful family. A definite re-visit with Kell and Leah for me! Received an ARC from Harlequin (HQN) via NetGalley for an honest review.